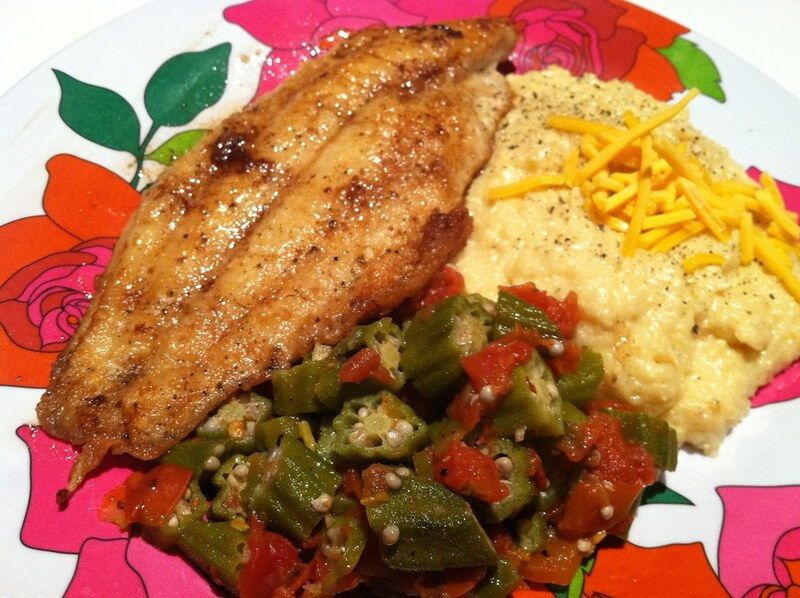 a taste of home…southern fried catfish, cheddar grits and stewed okra – ugly food tastes better. I am taking a short vaca to see my family in South Carolina at the end of the month, and I am so beyond ready for some good Southern cookin’. I had a super intense okra craving yesterday, and my market happened to have a nice, fresh looking stack! HOORAY! This would go great with the catfish filets I defrosted! Now what to do for a side….OH! 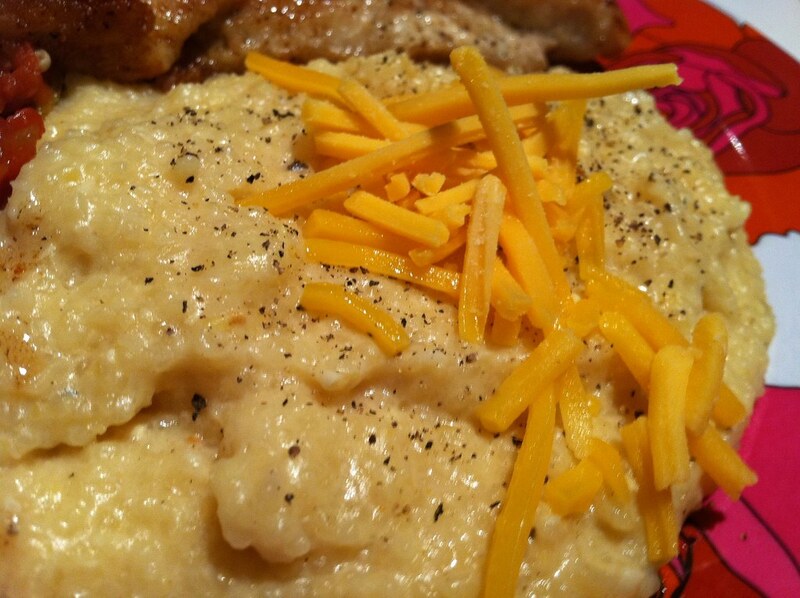 Since I will going to re-up my Southern food staples, I could use the rest of my grits! Now, if you know anything about the South, you know that grits are serious business. Any self-respecting Southerner knows that in order to consider your grits GRITS, they should be stone-ground and take an hour minimum to cook perfectly. Mine usually take an hour fifteen. Anything else is considered blasphemy. I keep seeing that scene from My Cousin Vinny in my head where Joe Pesci discounts a witness because he is Southern and says it took him 5 minutes to make grits for his breakfast. Haha. Fist n grits with stewed okra. Serves – 2, with grits leftover for breakfast tomorrow, of course! Nutrition – Fried is always bad for you. Thank god you are eating it with vegetables. And again, its a lot of butter, but these are all whole foods, and catfish is a low mercury, low calorie, lowfat fish. The fat is does contain is healthy, and it has a lot of B-12 and complete proteins. So you could do way worse. With like, chicken fried steak for example. as much fresh ground pepper as you can take, white pepper is great here too. Starting with the grits, heat all the ingredients saving grits and cheese to the side and bring to a low boil. Add in grits and stir, reduce to the lowest setting and then cover. You want to find a happy medium of stirring the grits with a wooden spoon and gently dragging it along the bottom of the pan without scraping it. Some of the grits will stick, this is okay. This should cook for an hour minimum. When the grits are still slightly coarse and the mixture is getting thick and creamy, add half the cheese if you wish, and then top them with the rest, and in my case, MORE pepper. For the okra, heat a tiny bit o butter in a pan to brown your garlic, then add in the tomatoes, undrained, and stir for a couple minutes. Add the red pepper, salt, and black pepper, and stir. Then add in okra, chopped to be about 3/8″ thick. Stir and cover, checking at 5 minute intervals until it is soft. 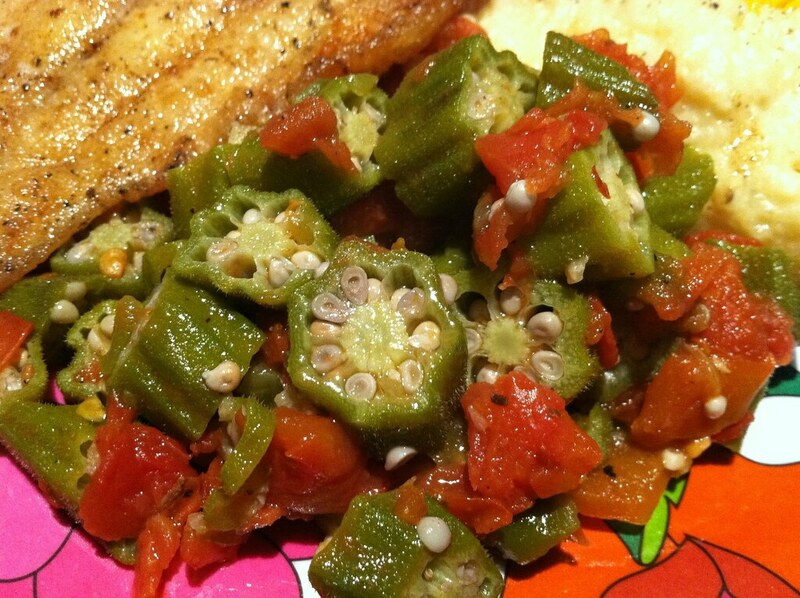 You want to be very careful not to overcook okra, cause it will get slimy and weird and that’s gross. 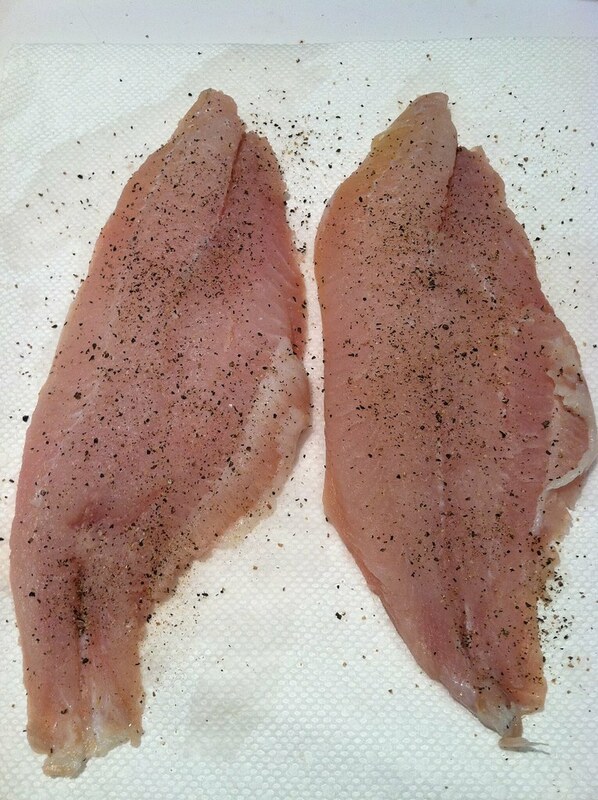 When everything is almost ready, take your fish out, pat dry and sprinkle both sides with salt and pepper. Lightly coat each side with flour and then heat the butter in a good, non stick frying pan. once the butter is melted, add the filets and cook 3 minutes on each side. Now, with these three powers combined, you have a lovely, heart-warming and delicious Southern meal with which to impress your friends! Congratulations! The buttery fish should flake on to your fork when you break the lightly fried, crispy exterior and practically melt in your mouth. The cheesy and well textured grits pair perfectly with this, and the warm, healthy stewed okra should finish off the perfect bite of Southern deliciousness. Put some South in your mouth! Oh I just love this. Grits are the best thing in the world, and being from MA I can only imagine how you must feel. I want to go get some catfish right now. 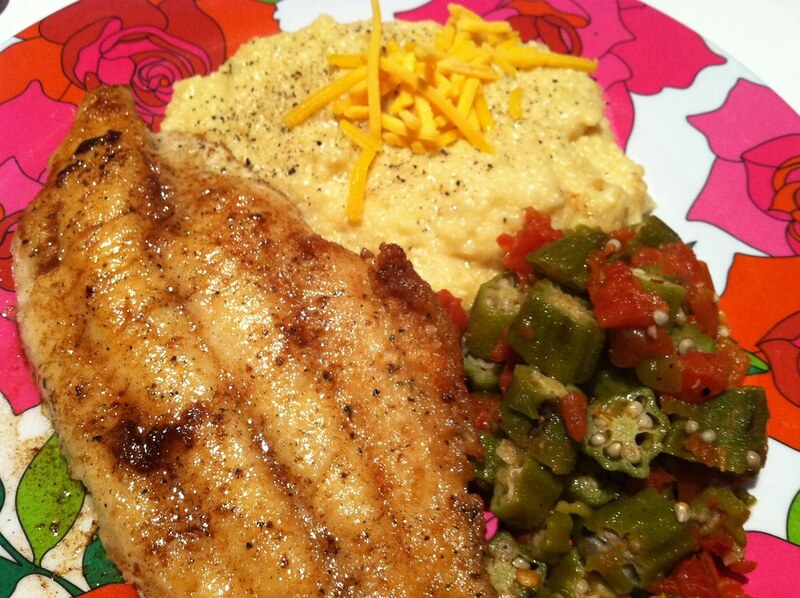 I love grits, okra, and catfish so this is the perfect meal for me! Especially since it’s fried! I actually read something the other day about frying. As long as you have the oil hot enough, whatever you fry should be relatively greaseless and (get this!) healthier than pan-frying because once the outer shell of whatever you are frying sets, your food won’t absorb fats!